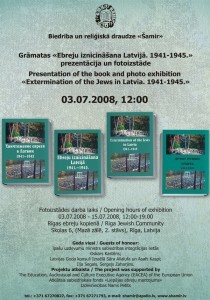 In February 2009 the project “Extermination of Jews in Latvia. 1941-1945. Series of lectures”, Editor Rabbi Menachem Barkahan, was completed. The book is published in Russian, Latvian, English, French, German and Hebrew. Project was supported by Education, Audiovisual and Culture Executive Agency (EACEA) of the European Union, Open Public Foundation “The Liepaja Jewish Heritage” and private donors.